The 2020 Chevrolet Silverado HD is getting revealed today in Michigan, so—presumably to take away some of the attention—Ford just released some basic info on the 2020 Ford Super Duty. There’s a new 7.3-liter gas motor, more power and torque from the 6.7-liter diesel, and a new 10-speed automatic transmission. Here’s a first look at the new heavy duty line of Ford trucks. When asked whether it was a coincidence that Ford released new details on the day of the Silverado HD reveal, a company spokesperson responded with simply: “I don’t know. You’ll need to ask Chevrolet.” Looking at the press release, the answer seems obvious, mainly because there’s a lot missing. For one, there’s no mention of torque, which in the heavy duty truck world—where the torque wars are in full swing, with Ram dealing the latest 1,000 lb-ft blow—is critical. Plus, there are no towing figures, no horsepower figures, and frankly, just not a lot of figures at all. Towing and payload capabilities, Ford says, will also go up for 2020. Managing the output from the updated diesel and all-new gas motor will be a 10-speed “TorqShift” automatic transmission, which Ford says will be available on the 6.2-liter as well. All current Super Duty Fords use six-speed autos, so this is quite a jump in gear count. 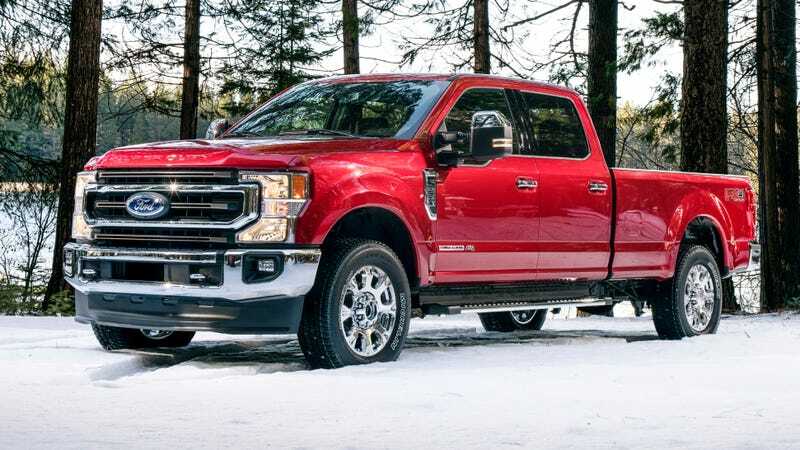 The 6.7-liter engine shown above, Ford says, gets all new injectors, a redesigned variable-geometry turbo, as well as structural changes to the head, block, connecting rods, pistons, and bearings. As for the 7.3-liter gas motor—which Ford fans may notice shares its displacement with the legendary Navistar-designed 7.3-liter PowerStroke diesel found in Super Duties in the ’90s and 2000s—Ford says it’s a brand new engine architecture, though it’s got lots of classic old truck motor characteristics, including a cast iron block, a pushrod design, and port injection. On top of the powertrain upgrades, the new Super Duty gets a new front end design, some interior updates, more standard safety features like automatic emergency braking (on XLT and up), and a bunch of fancy new electronic gadgets like Pro Trailer Backup Assist to help you snake that huge horse trailer into your driveway.